I posted last week a word cloud visually displaying the prevalence of words in the lyrics from my band's new Album, "Sunday Morning Drive." I thought of another one that might be fun. On closer inspection several words actually surprised me a bit. "Respect" and "family" both were larger than "money" or "businesses" (though the word "business" still outweighed all of them). And interestingly, "fear" showed up rather large as well. "Work" shows up in tiny yellow at the upper right. Apparently, "work" is not the word first on many of these authors' minds. Or perhaps they've repackaged it into a more pleasant thought hidden amongst all these words. If you're curious, I used the online application, Wordle.net to create this word cloud. 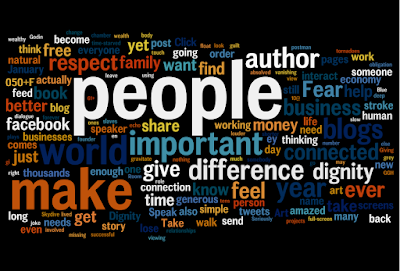 You can plug in any text or link to a web page and it will generate a word cloud based on the content. Check it out and let me know if you make any word clouds of your own!